More and more, the fragments of your life exist as particles on a disk mounted inside your computer — disks susceptible to temperature changes, power surges, fire, theft, static, and just plain wear and tear. Hard drives fail. It's a fact of computing life. It's not a matter of whether your computer's disk will stop working; it's a matter of when. The question is how much it will disrupt your life — and it won't, if you have a backup copy. Backing up your data is the dullest but most indispensable thing you do on your computer. Here's how to automate regular backups for your computer, both on-site (to an external hard drive or another computer), and off-site (to the internet). This system can even email you if something goes wrong, so it's the ultimate set-it-and-forget-it situation. After you get this up and running, you'll never have to worry about losing data again. 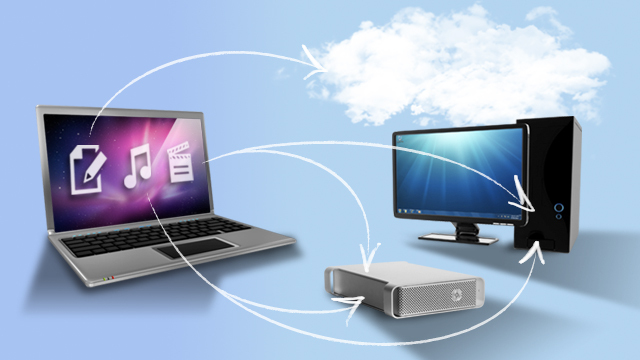 Local external drive backups are great for quick recovery when you've accidentally deleted a file, or if your computer's internal hard drive crashes. But what if your house burns down or gets burglaried - including your backup drive? Hurricane Katrina victims can tell you that no matter how diligently you back up your computer to a local hard drive, you will still lose your photos, documents and other important files if you don't keep a copy off-site, preferably out of state. Some users keep an extra hard drive with a copy of their important files at the office or at their mother's house in case of theft or fire. But that requires manually transporting your hard drive back and forth on a regular basis, and you want to set it and forget it. CrashPlan: Available as a free download for all three platforms. A CrashPlan+ account for off-site backups. In addition to local backups, CrashPlan can also back up your files off-site to their servers (which they call CrashPlan Central). As of this writing, unlimited backup at CrashPlan costs $US5 per month per computer, or $US10 per month for a household of two to 10 computers (if you pay for a year in advance). You can compare your CrashPlan options here. You don't strictly have to pay for CrashPlan+ (you can still back up off-site to a friend's computer), but I'd strongly recommend doing so for your off-site backups. Note: As we've pointed out before, there are no shortage of tools available offering unlimited off-site backups. Having examined the options myself, Crashplan's my favourite tool for the job. $US10/month will give you unlimited backup for a whopping 10 computers, which is a better prices than a lot of services offer for one computer. I actually went ahead and bought four years, which brings the price down to an extremely reasonable $US6/month. Choose the Files and Folders You Want to Back Up After you registered, the software scans your system, suggests which directories it should back up, and lets you know how much space those files will use in the Files section of CrashPlan's Backup window. If you don't want to go with CrashPlan's suggestions, you can manually choose which files and folders it backs up. To do so, click the Change button. Choose Your Backup Destinations You have four Destination options to which you can back up your files, all of which are accessible through the Destinations tab in the CrashPlan desktop application. You can back up your files to any combination of those destinations. You can choose simply to use CrashPlan to back up files to an external hard drive (choose the Folders option), to another computer on your home network (choose Computers), to a friend's computer over the Internet (choose Friends), or to CrashPlan's servers (choose Online). CrashPlan is completely free to use with every destination but Online, which requires a paid CrashPlan+ account. To achieve both on-site and off-site backups, you should strongly consider backing up to a local drive and to CrashPlan's servers with a paid CrashPlan+ account. Tip: If you don't want to pay for your off-site backups, CrashPlan has a clever trick up its sleeve: It enables you to back up to a friend's computer across the internet. Your friend needs CrashPlan installed and hard drive space to accommodate you, but it's a handy option if you're not backing up a lot of files. Choosing your backup destinations is simple: Click the Destinations tab, click the type of destination you want to set up, and point CrashPlan to the appropriate hard drive, folder, computer, or CrashPlan+ account you're setting up. Select Between Specified Times from the Backup Will Run drop-down menu. Set your preferred backup times. From the Settings panel, you can also adjust how it should notify you and how much bandwidth and computer power it should use to get its job done. After you configure CrashPlan's Settings the way you want, click the Save button. Start Your Backup After you configure CrashPlan to your liking, click the Backup tab, and click the Start Backup button; then click the Start button to the left of the progress bar. (It looks like a Play button.) Your first backup can take a long time depending on how much data you back up and, if you back up off-site, how fast your Internet connection is. On a laptop, CrashPlan estimates it will take days to complete a backup to CrashPlan's servers. For a local backup, it'll take just a few hours. CrashPlan does differential — or incremental — backups; that is, it backs up only portions of your files that have changed since the last time they were backed up, so while your initial backup may take a long time, subsequent backups will take significantly less time, so don't let the first backup discourage you. The main benefit of a paid CrashPlan account is that it's a reliable, off-site storage option. If someone stole both your laptop and your external drive, for example, you could still recover all your backed up files from CrashPlan's servers. As mentioned above, CrashPlan does allow you to back up to a friend's computer (provided that friend is also running CrashPlan on her computer); while that's better than no off-site backup, it's not as solid as using CrashPlan's servers. CrashPlan's backup process encrypts the files on your computer using either an encryption key it chooses or your own private key. CrashPlan uses stronger encryption algorithms with its paid accounts than its free account (though both are encrypted), so you don't have to worry about anyone intercepting your files when they're transferred over the Internet. If you delete a file on your computer, CrashPlan marks it as deleted on their servers but holds onto a copy on its side forever — unless you tell it not to. That way, you can recover a deleted file no matter how much time has passed. Open the CrashPlan software on your computer, click the Restore tab, select the backup destination you want to restore from, and pick and choose the files you want to copy back to your system from your backups. Click the Restore button. On the CrashPlan website, from the My Account page, click on Computers, and then click the Restore button next to the computer you want to restore files on. You can browse your backup, tick the check box next to files you want to restore, and then click Restore. If you're not using the computer with the CrashPlan software installed, you can download the restored files as a ZIP archive. This feature is only available for paid CrashPlan accounts. For a detailed guide to all the ins and outs of CrashPlan, see the official CrashPlan documentation. My CrashPlan Setup As mentioned at the start of this guide, CrashPlan is far from your only option for backing up your files. Aside from some of the other unlimited backup tools, many people are perfectly happy backing up only their most important files using the popular sync-and-then-some tool Dropbox. It's really a matter of preference. With my laptop, for example, I use Dropbox for important documents in addition to CrashPlan (maybe I'm a bit of a redundancy nut). Using CrashPlan, I back up to a Windows desktop on my network as well as to CrashPlan's servers with a CrashPlan+ unlimited account. The local backup (to my Windows computer) happens very regularly while I'm on my home network — something like every couple of minutes, which is reassuring. I've set my off-site backups to CrashPlan's servers to run whenever my laptop is idle for 15 minutes. If you wanted, however, you could set CrashPlan to send backups as often as once per minute. I don't do this because I've got Dropbox there for more instantaneous backups. The upshot: I have very few worries about losing an important (or, frankly, not that important) file. It takes a little time, effort, and yes, occasionally some money to set up, but for me, the peace of mind is very worth it. If you haven't committed to a backup plan, maybe an event like World Backup Day and a step-by-step guide like this one can convince you it's worthwhile. If you've already got a tried-and-true backup plan: What's your full backup plan look like? Boast about your file redundancy in the comments. Does CrashPlan only backup files and folders or can it do system states and whole drives a la Acronis TrueImage Home? Their is an alternative to consider, SpiderOak. While their paid plan is $10 a month or $100 a year for 100GB of storage, their is no limit to the number of computers. This could be a better option if you have say 30 computers with only 2-3GB of data to backup up on average. A added bonus of setting up sharing of some items as well. I have been using the free version of crash-plan for a while now. I am storing to two external HD's, one I keep off site so I never have all my data in the same physical location at the same time. However I am wanting to move away from crash-plan and find a new solution for one simple crucial problem. What if the company fails? My understanding is that even my local backup requires internet access to their servers. On all the glowing write ups of the service this is something I don't see mentioned much. This is a serious weak link in their whole system. Can anyone confirm this? If their servers go down, or for some reason I can't connect to the internet at all, I have no way to access my backups even though they reside completely on external hard drive's I have in my possession. Yes, you do appear to be correct in your observation. Companies come and go. If this one goes I suspect that even our local (or friend) backs would be useless. CrashPlan needs to address this. You really need two simultaneous solutions. CrashPlan is great, particularly because of its economics. However, it is NOT a 'bare metal' restore solution. When your hard drive fails, in order to make use of your CrashPlan recovery, after replacing your drive you will have to install your OS of choice, install all of your software (liek Office), and then finally begin restoring your data from CrashPlan. For the eventual hardware catastrophe, you need another piece of the puzzle, which is a true partition backup. I use Acronis True Image Home for this. The newest version, 2012, has a lot of new features that I'm finding are of value. In particular, I have TIH do a scheduled incremental partiton backup to my NAS as well as my HTPC (Dell Zino 410) which is always on (or asleep) and is also the one machine that I have CrashPlan+ Unlimited installed on. For its part, CrashPlan then backs up this image to the cloud for me. So, I have all of our home machines image themselves to the CrashPlan pc regularly, which further safeguards these images to the cloud. Inthe event of a hardware failure, I can replace the disk, and TIH will restore the image; even to completely different hardware, and I'm right back to where I was before the crash. Meanwhile, if I simply get a virus or some such that causes me to lose files, I can restore them from CrashPlan. I use a Synology DS1511+ NAS which runs a Crashplan client and performs backups on a schedule to Crashplan Central. I use sugar sync to backup my desktop and documents folder (about 900mb all up) while crash plan for iTunes, movies ect. my files on that old drive or if i have no choice but to format it and will it wipe out everything. there is certainly quite a bit of family photos on there.